Even people who think history is boring find Sicilian history interesting. History can explain everything we see around us and, in Sicily, the stories are usually amazing and intriguing. 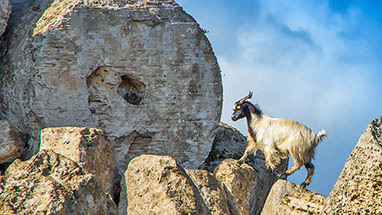 You may wonder, for example, what that goat is doing [photo, right] in the ruins of the ancient Greek City of Selinute. Perhaps you'd like to know why Palermo Cathedral has part of the Koran carved into its wall. Almost every tourist who visits Sicily for their holidays wants to understand how the Mafia got started. Historians fill whole books with answers to these questions, but we will take you on a journey through 2000 years in just two minutes. If you do want to go into more detail, we recommend the Wikipedia article on Sicilian history. There have been very few times in Sicily's history when the island ruled itself. Sicilians have almost always been part of someone else's empire. The various foreign "occupiers" of Sicily are often used to explain how Sicily evolved, but also as scapegoats to blame for the island's lack of modern progress and for the nurturing of the Mafia. Whilst there is some truth in this argument, it has also been used as an excuse for sitting about in denial. Nowadays the Sicilians themselves are tackling and beating the Mafia. Stay updated! Subscribe to our free Newsletter. Holidays in Sicily on Facebook. Holidays in Sicily on Pinterest. Holidays in Sicily on YouTube. Result: Sicily is now a frontline state between two rival cultures. Her position in the centre of the Mediter­ranean makes her the known world's most desired trading post and military base. The Africans revolutionise the island's industries (pasta and ceramics for example), administrative systems, military defences, and architecture. Many new cities are founded. Sicily is the most multicultural place in the world. Greeks, Jews, Africans, Italians, indigenous peoples and Arabs have their own languages, customs, foods, religions and legal systems. Thanks to the land reforms there are no landless peasants any more, but only 1% of the farms are larger than 50 hectares!